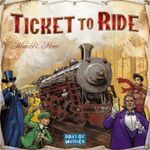 Includes Ticket to Ride: USA 1910. This is the original printing of the game, with the score track that goes up to 80, and no colour blind symbols on the map. No insert, although all of the cards and pieces are bagged separately. Box has some minor wear on the corners. Game includes an as new copy of the 1910 expansion (recently replaced an older copy of it), and original mini cards are also included. 1910 train cards are all sleeved. I no longer need this version as I have sold on my map packs, and I have the anniversary edition. Overall, game is in a very good condition.